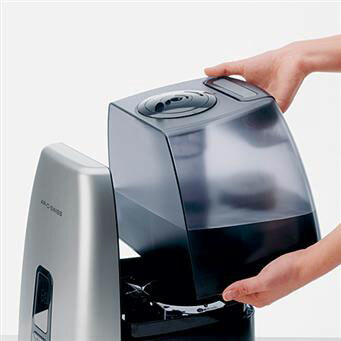 The Boneco by Air O Swiss 7144 Ultrasonic Humidifier has been discontinued. 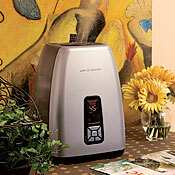 As an alternative we recommend the Boneco by Air O Swiss 7135 Ultrasonic Warm & Cool Mist Humidifier. Accessories available for purchase below. The Boneco by Air-O-Swiss 7144 Ultrasonic humidifiers are attractively styled, easy to fill and deliver an abundance of cool or warm mist. A built-in hygrometer monitors the temperature and humidity levels in order to provide the perfect amount of micro-fine mist for unsurpassed air quality. 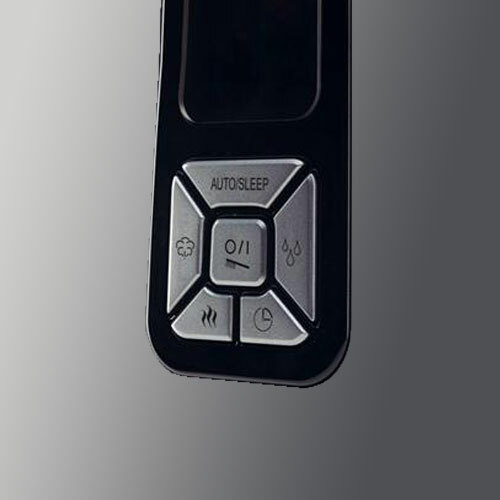 Operation is a breeze because of the large LCD digital display controls, output regulator button, sleep and timer modes and easy-to-fill transparent water tank. A demineralization cartridge and Hydro Cell keeps the humidifier clean and fresh longer. Covers up to 650 square feet. Compare all models using our helpful Boneco by Air-O-Swiss Comparison Chart. 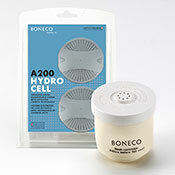 See all Boneco by Air-O-Swiss replacement filters and accessories. About Ultrasonic Technology: uses high-frequency vibration to generate a micro-fine mist. A fan blows the mist into the room where it immediately evaporates. Ultrasonic humidifiers consume very little power, are virtually silent and produce a fog-like mist. Cleaning: The recommended cleaning intervals depend on the air and water quality, as well as operating times. Every two - four weeks the water tank and base should be cleaned and rinsed with water only. 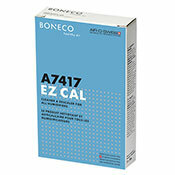 If soft water is used, decalcifying the unit every 4 weeks with EZ Cal is suggested. If hard water is used the unit should be decalcified every 2 weeks. Only use the brush that is included to clean the membrane once a week. Change the water in the tank at least once a week if water is standing for more than a week. Resetting the cleaning light: The cleaning light does not automatically reset. Hold down the power button (button A in instruction manual) until the light stops flashing. The light automatically comes on approximately 14 days after plugging in the unit. Replacements: The Hydro Cell is an advanced water maintenance system that ensures your humidifier's functionality while providing fresh humidification performance. It needs to be replaced every 1 - 2 months depending on water quality. The demineralization cartridge has to be replaced every 2-3 months. If the water is very hard, it may be necessary to replace the cartridge earlier. White dust around the device is a sure sign that the cartridge needs replacing. See all Air-O-Swiss replacement filters and accessories. Please note: In order to maximize the performance it is recommended the unit be placed at least 2 feet off the floor to allow the mist the opportunity to evaporate before hitting the floor and to eliminate the carpeting or wood floor surrounding it from becoming damp. Using water that has been treated by a water softening system could result in an increased incidence of white dust due to the excess sodium in the softened water. Therefore, it is recommended to use water that bypasses the system, bottled, or distilled water. Use of this product with a negative ionizer air purifier or air cleaner with an optional post ionizing function could contribute to an increased collection of dust on surfaces. If this occurs try operating this product without the negative ionizer air purifier or with the optional ionizing function on the air cleaner off. There is no doubt that the Boneco by Air O Swiss 7144 deserves our 5 star rating approval. Its versatility, reliability, attractive design and wide range of excellent features make this humidifier a great fit for virtually any home. 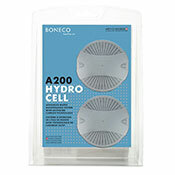 The Boneco 7144 provides powerful humidification into spaces as large as 650 square feet. It's near silent operation and programmability make this machine not only effective, but convenient to your specific needs. 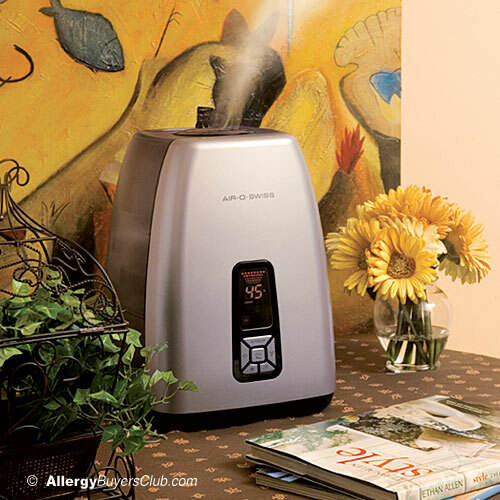 The Boneco by Air O Swiss 7144 is a truly impressive humidifier that is sure to please. Room Coverage 650 sq. ft. Replacement kit is packaged to last the season. Includes 2 Aqua Pro A250 2-in-1 demineralization and purification cartridges (replace every 6 months) and 1 Hydro Cell 2-Pack (replace very 1-2 months).